IntelsatOne Flex is a customizable service that will bring together the new Intelsat EpicNG high-throughput satellites (HTS), our existing Ku-band fleet, our global ground network, and optimized iDirect Velocity terminals into a unified ecosystem. Flex will give you a global platform for small, geographically dispersed mobile terminals that will integrate the multi-spot-beam EpicNG platform into your existing infrastructure and make more efficient use of bandwidth. Simplify the integration of EpicNG HTS into current wide-beam network designs. Customize, contend, prioritize and shape bandwidth for end-user segments. Choose among tiered plans to meet average and peak bandwidth requirements. Quickly and easily scale services to meet surge requirements or geographic shifts in demand. Flex will save you money by pricing services based on both your average and your maximum level of service. By using a centralized network management system, we will be able to monitor your utilization and add MHz capacity to “pinch-points” on a global basis across all vertical markets, adding bandwidth where needed to create an enterprise-grade quality of service that meets your needs. The network management system will also allow us to guarantee throughput for high-priority applications like emergency response or other mission-critical activities. Commercial availability of Flex is tied to our Intelsat EpicNG launch program. The first EpicNG satellite (IS-29e) is expected to go into service in March/April of 2016, kicking off the first phase of the Flex service. We will launch additional EpicNG satellites throughout 2016/2017 that will be included in the service offering. 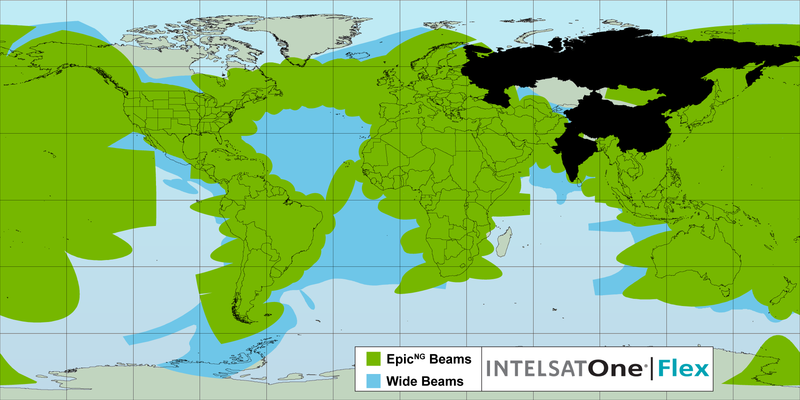 Wide beam satellites will augment the network for additional coverage on a customer-by-customer basis, starting with full North Atlantic coverage via the IS-34 satellite.